Last week, I reviewed the Pokemon: The Indigo League. So this week, I decided to review the follow-up season, Adventures on the Orange Islands, which took place between the Kanto (Indigo League) and Johto chapters and ran from January to October 1999 in Japan and December 1999 to October 2000 in the U.S. I watched Adventures on the Orange Islands as a kid (I was 7 then), but my memory of it was super hazy. 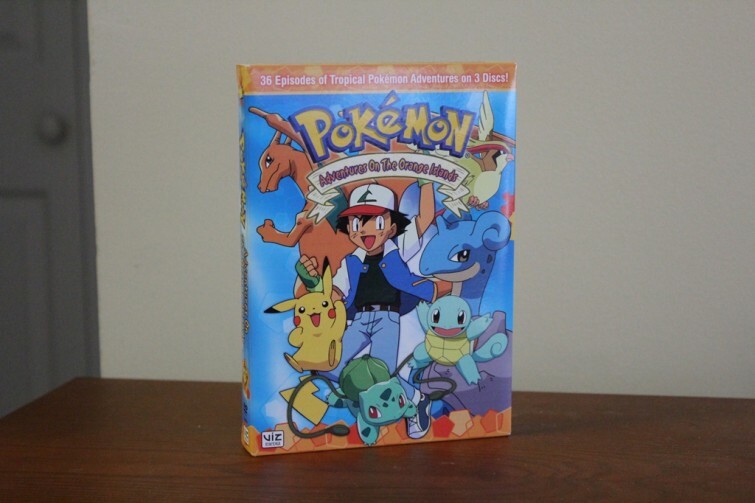 I picked up the series box set last year, expecting it to be an introduction to the Johto League chapter. This wasn’t really the case. The only Johto league Pokemon that made an appearance in the season was Tracey’s Marill, the Water/Fairy Pokemon. Although Ash and company are in a brand new sub-region, it feels like just an extension of the Kanto chapter– a sort of side-quest. Still, the 36-episode season covers a lot of narrative ground. Professor Oak sends Ash, Misty and Brock to the Orange Islands to retrieve the mysterious GS Pokéball found by fellow researcher Professor Ivy. When they reach her lab, moonstruck Brock decides to stay with the Professor and her three female assistants. Although, I was originally a bit gloom to see Brock split with the gang, it made sense. Having grown up with many young siblings, he always had a nurturing spirit and an eagerness to be helpful that was needed more with Professor Ivy than with Ash and Misty. Ash and Misty are joined by Tracey, a “Pokémon Watcher” in training who sketches. After the perpetually amorous Brock, Tracey is a more level-headed companion. The characters roam from island to island, escaping the snares of the inept Team Rocket, who are just as annoying and pointless in their pursuits as ever. Ash challenges himself to obtain the islands’ Coral Eye, Sea Ruby, Spike Shell and Jade Star badges, which will qualify him for the Orange League Tournament, where he finally learns to make his recalcitrant Charizard obey him. The subtitle “Adventures in the Orange Islands” is not used within the episodes, but was later added by the DVD boxed sets to distinguish it from the later seasons. So it shouldn’t be surprising that the season feels like just a run-on of the previous Indigo League narrative. The only real difference is that it takes place in a more coastal environment and Brock has been temporarily replaced with Tracey. Adventures on the Orange Islands doesn’t remedy any of the issues that I had with Ash and friends’ adventures in the Kanto League. The episodes, which were churned out really consistently, feel really rushed. The Pokemon battles are still not as strategic as they could have been. In fact, many of them are even less dynamic than in previous chapters. There are few antagonists that feel truly threatening. And I still rarely get the feeling that Ash is growing as the hero of the series. But anyone who enjoyed the Indigo League narrative will find the Orange Islands just as engaging. The change of setting actually makes the the season’s progression much more structured. Instead of simply walking to the next town or location, Ash and friends have to travel the seas to the next island where a new set of challenges awaits them. The box set itself isn’t particularly impressive, but it isn’t awful either. This set was manufactured by Viz Media, which is notorious for sloppy work. The menu graphics are expectantly poor and some minor details of the box set itself are somewhat amateurish in presentation. But for me, all I cared about what the audio-video quality and the compactness of the box itself– both of which get my stamp of approval. To check out my review of Pokemon: The Indigo League, click here. You can order Adventures on the Orange Islands right here.